Mix first 4 ingredients in small saucepan. Gradually stir in milk; cook on medium heat 5 min. or until heated through, stirring constantly. Pour coffee into 2 mugs. Add milk mixture; stir until blended. Be sure to use canned pumpkin, not pumpkin pie filling which contains added ingredients. 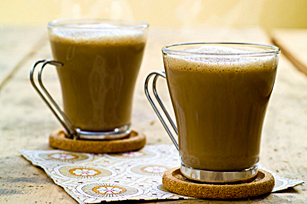 This delicious spiced hot latte provides an excellent source of vitamin A from the pumpkin.